Check the past values for one property in a record, all properties in a record, or export the property history for one property across all records. In your HubSpot account, navigate to contacts, companies, deals, or tickets. Click the name of a contact, company, deal, or ticket record. In the left panel, scroll down to click View all properties. Hover over a particular property and click See history. In the right pane, view the history of values for this property. In the left panel, click View property history. View the history of all values in all properties of the record. Click the tab with the type of property to export. Click the name of the property. In the top-right corner, click Export property history. In the dialog box, enter the Email you want the property history export sent to, and select a File format. Then, click Export. View the CSV file for the values in the property across all objects. 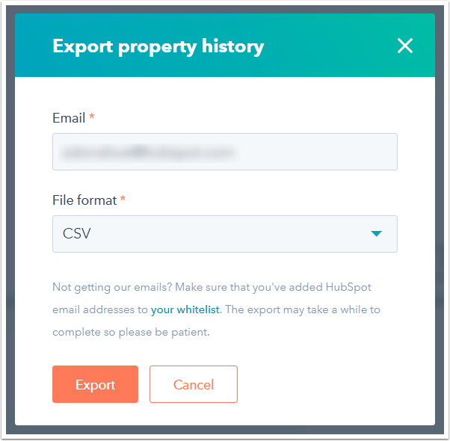 If you want to restore the historical values of your contact or company records, look for the date of the change in your CSV file, and then reimport the values that were in HubSpot prior to that change.